So, is this the beginning of PCs that give a digital readout of your brain? I don’t see why not. 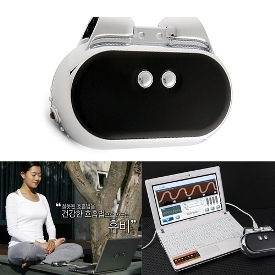 In fact, could someone design a meditation device that is put into a mouse, then you would always have a mental readout of your stress levels. You would then learn how much stress your job really gives you. The price of this device is about $206, which might give you more stress. Yes, I just can’t seem to escape the irony that much of our stress is invariably caused by technology. It’s nice to know that someone is making tech to bring our stress level down.